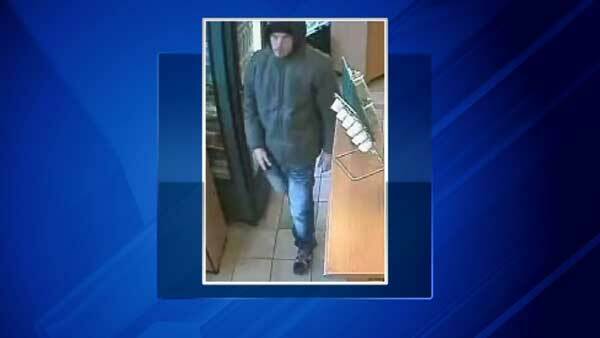 CHICAGO (WLS) -- A man robbed two fast-food restaurants at knife point in Chicago's Lakeview and Wrigleyville neighborhoods in the last week, police said. The most recent incident occurred around 11 p.m. in the 1000-block of West Belmont Avenue on Feb. 8. The first restaurant was robbed around 4:45 p.m. Saturday in the 3700-block of North Clark Street. Police said the suspect walked into each restaurant armed with a knife and demanded cash from the register. Authorities released surveillance photos of the suspect, who is described as a Caucasian man in his late 20s with a slim build. In the most recent robbery, police said the suspect was wearing a black Northface jacket. In the first robbery, police said he was wearing an olive green drab jacket over a blue hooded sweatshirt, blue jeans that were bleached or stone-washed on the thighs. Anyone with information regarding these fast food restaurant robberies should contact Area North detectives at (312) 747-8263. Surveillance photo of suspect in robbery of fast food restaurant in the 3700-block of North Clark Street.